Guest edited by Dutch eating designer Marije Vogelzang, the “Design:Digest” edition of Design Indaba magazine gets to the gut feelings around food and design. “It makes sense to use food as a topic and medium for design. The world has never seen more schizophrenia on the food side of life than today,” writes eating designer Marije Vogelzang, guest editor of the new “Design:Digest” edition of Design Indaba magazine, sponsored by Foodcorp. Based in the Netherlands, Vogelzang exemplifies design as content over form, focussing her practice on the experience of eating, and is the originator of numerous eating experiments and projects. Focussing on the creative thinking around eating, she has considered food from the perspectives of culture, nature, society, the senses, technology, science, psychology and materials. Chefs Ferran Adrià and Rene Redzepi, MoMA curator Paola Antonelli, nutrition activist Marion Nestle, urbanist Carolyn Steel, behavioural economist Brian Wansink, innovator Homaru Canto, and designer Martí Guixé headline. A special bumper edition, contemporary eating topics such as pop-up restaurants, food markets, foraging, farming, synthetic food, alternative materials, vegetarianism, future food, conviviality, sustainability, sovereignty and packaging are all featured through the perspective of design. Beyond merely creative endeavours, the “Food Fight” debate brought together over 40 designers, thinkers and activists to articulate their opinions about the state of eating in the world today. The likes of Dan Ariely, Jennifer Rubell, Peter Reinhart, Martin Hablesreiter, Bruce Nussbaum, John Thackara, Dan Barber, Gidon Eshel and Marcel Dicke are joined in the barney by South Africans Neil Stemmet, Richard Carstens, Reuben Riffel, Anelde Greeff, Justine Drake and Sumien Brink, among others. Readers are also invited to participate and voice their opinions online at www.designindaba.com/news/showcase/food-fight. “Design:Digest” is a contagious discussion about the democracy of food as a design subject in the sense that it influences all of us. As Vogelzang herself says, food as subject matter is the one way for a designer to literally get inside a person. 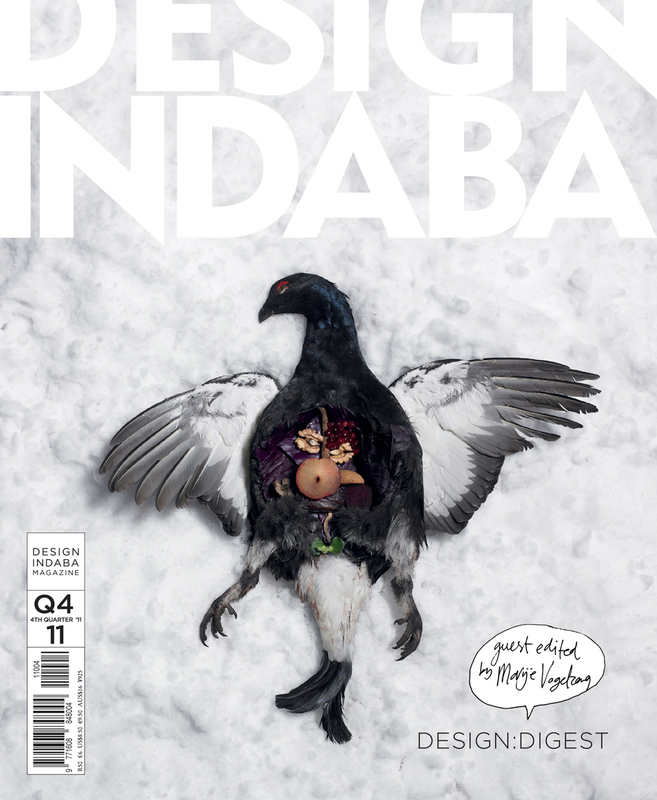 Let Design Indaba magazine get inside you. Design Indaba, Q411 “Design:Digest”, is launching on 16 November 2011. Find it at selected Exclusive Books, Woolworths and other stockists, or online.